Direkte Lage zum Strand ,freundliches Personal,sehr gutes Frühstück. Die klimatisierten Zimmer im Hotel Llafranch empfangen Sie mit einer hellen und attraktiven Innengestaltung sowie einer Minibar. Das Hotelrestaurant ist auf Fischgerichte spezialisiert und bietet Ihnen darüber hinaus eine Auswahl an traditionellen katalanischen Gerichten. Von der Terrasse des Restaurants genießen Sie einen herrlichen Blick auf das Meer. Das Hotel Llafranch bietet Ihnen zudem organisierte Ausflüge auf dem eigenen Boot an. Das Emporda, die Region in der Umgebung des Hotels, eignet sich hervorragend für Wanderausflüge und den Golfsport. Der nächste Golfplatz ist 10 km entfernt. Kein deutsches Fernsehen im Zimmer.Disco Sonnabend Nacht von halb zwei bis vier Uhr morgens sooooo laut. 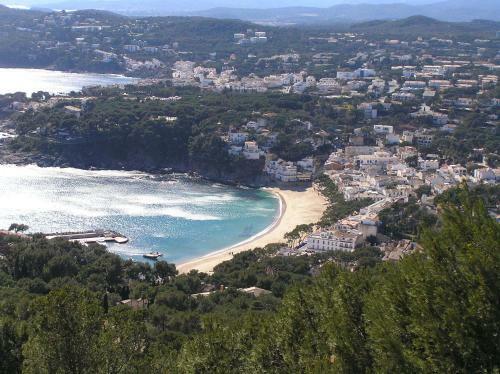 El lugar es de los mas bonitos de la Costa Brava. Es un trato muy impersonal . No tiene espacios para estar. No resulta confortable. Me ha gustado mucho la atención del personal del hotel, muy familiar. La ubicación del mismo es fabulosa, así que hemos estado muy a gusto, repetiremos. Se podría mejorar la disposición de las cafeteras en el desayuno,ya que se junta gente en esa esquina y se complica el momento de cortar pan y servirte café. El personal superamable, todo atenciones. La ubicación, única. La atmósfera, cálida y acogedora. El desayuno, sublime. This is a hotel in a very small seaside village. It has an elevator, plenty of staff, and a wonderful breakfast. The rooms are a bit outdated, but the location totally makes up for it. We stayed in a less expensive room that was 50 feet from the beach. Hearing the waves all night long was amazing! We will return to this wonderful place. les habitacions una mica justetes. Ordenador-internet fuera de uso,habitación pequeña,ruidos hasta madrugada,queja no atendida. nous apprécions l'emplacement de l'hotel, la gentillesse et le dynamismedu personnel et du Boss. la qualité du restaurant. nous venons régulièrement dans cet hôtel. Fantástica la ubicación, el hotel antiguo, pero bien conservado. La atención excelente y el desayuno muy bien. Por supuesto, volveremos. Buen trato personal. Desayuno buffet bueno. Al haber disponibilidad de habitaciones, por el mismo precio nos dieron una habitación con terraza y fantásticas vistas. Fue un gran detalle por parte del hotel. La habitación y el baño necesitan una actualización. Chanceux d'avoir une météo clémente, nous avons pu assouvir notre passion de la marche. La situation géographique est idéale pour la randonnée et autres activités sportives. La ubicación, las vistas, el servició de restauración. falta calidez en la atencion en el restaurante. La situació davant el mar, però sobretot el menjar i el tracte personal, que ha estat excel·lent. Que no hi ha parquing i és difcícil aparcar prop. Room with balcony clean, roomy and centrally positioned. Restaurant (breakfast and dinner) was good. All hotel service was good and friendly. Location, friendly staff who were very helpful. Ayant passé nos vacances fin octobre, nous avons été surclassés dans une chambre spacieuse avec balcon donnant sur la mer, vraiment très agréable. l'hôtel est très bien placé. La restauration est très bonne mais nous avons regretté, passant 3 jours sur place de ne pouvoir choisir un menu plus simple et moins onéreux. Les places de parking doivent , comme partout sur la costa brava, poser quelques problèmes en été. Great location, lovely family run hotel. Oceanfront room with balcony. Good situation. comfortable room. Pleasant staff. 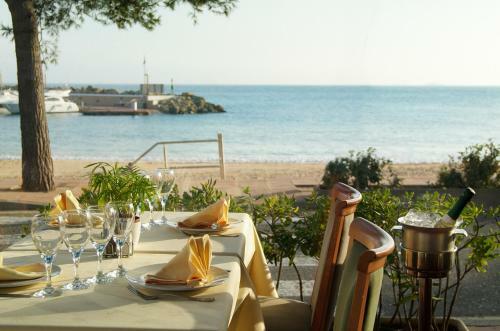 Hotel in perfect position overlooking the beach combined with wonderful staff and marv ellous food. Excellent professional and friendly staff. 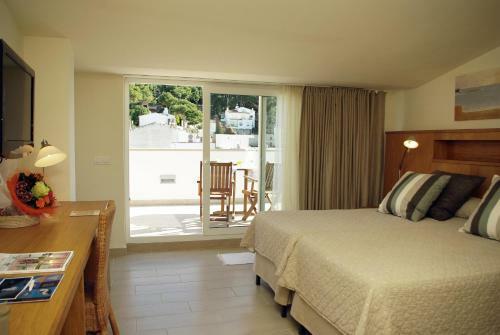 Superior room with balcony spacious well maintained very good wardrobe and drawer space. Location opposite beach. Abscence of Car parking facilities. No swimming pool, roof terrace had just 1 easy chair. Breakfast a bit hit and miss, fried eggs only on offer and availability ranged from quantity on offer but cold to complete abscence. Breakfast was served later than advertised. Otherwise nothing of note. La situació de l'Hotel és boníssima. És INCOMPRENSIBLE que a la terrassa, coberta i amb tancada al 75% es pugui fumar, però sobretot que NO estigui indicat i per tant et pots trobar que algú et vingui a fumar al costat. I a més amb les portes obertes al bar s'escampa l'olor desagradable. La situacion del hotel a pie de playa es inmejorable, el desayuno excelente y el trato exquisito.Un hotel para recomendar. Ubicaciòn perfecta, pocos metros de la playa, muchos restaurantes cerca. Personal simpatico. No me gustaba la ideia tener el desayuno en espacio semi-abierto, porque habia muchisimas moscas aprovechar a nuestra comida. Poca variedad de iogurtes, a vezes no habia ninguno. Podria mejorar mucho el desayuno en general. La ubicación es excepcional. Enfrente de la playa. Muy comodo. El precio es algo excesivo. La zona empieza a estar muy masificada y ya no es tan exclusivo . Position, relaxed atmosphere overall quality. Que me advirtieran del ruído nocturno de su propio bar de copas. La cocina de su restaurante. La amabilidad del personal. Our room was small and claustrophobic and with a ridiculously small cramped bathroom (my partner is 6'3") and looked onto an air shaft/internal wall. The hotel had horrifically loud music midnight to 4am on Friday and Saturday so we got no sleep. Definitely not good value for money (I work in the conference and incentive industry and stay in hotels year round - the price did not match the standard). 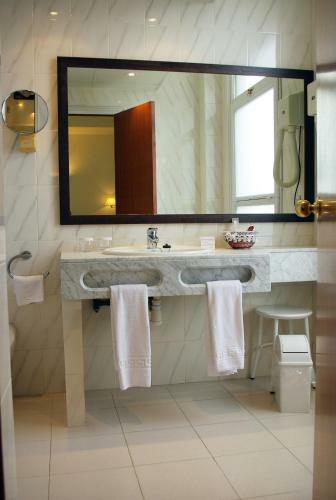 The feeling of the hotel was elegant and casual, very friendly atmosphere. We had a great 3 night stay. The breakfast which was included was delicious and plentiful. Parking was a little inconvenient. However our car was safe and we hardly needed it once we arrived. Fotografierna på alla kändisar som bott och festat på hotellet. La ubicación perfecta, a diez metros de la playa. 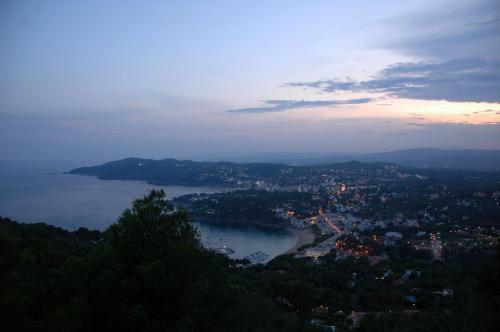 Llafranc es perfecto para descansar. A lot of stairs up and around to the room, once you come out of the lift. To eat in the restaurant quite expensive. Llafranc is a lovely location and our room at the hotel was excellent. El preu s'excedeix. Habitacions petites. No s'inclou mitja pensió o pensió completa i en cas que sigui afirmatiu, el preu s'excedeix encara més. Very friendly man at the check in desk. Lovely town to stay in. 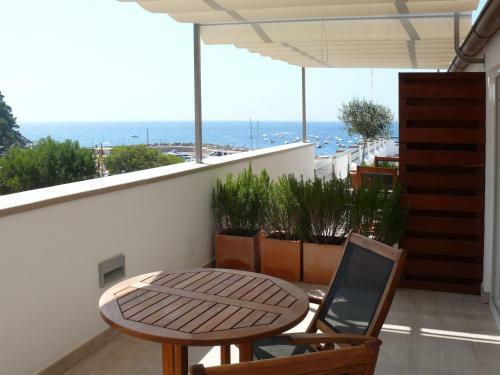 Room overlooking the sea, great location. Rooms a little tired - could do to be modenised. The staff especially the receptionist Anna, were very courteous, polite and very helpful in every way, the set lunch in the al fresco dining room was lovely and good value. we arrived very late from the airport, 'after midnight on a Sunday' we were warmly welcomed and were served a simple snack supper of cheese, ham, and hot tomato bread, the overall offer was exceptional, will go again soon! Great position on sea front .Nice rooms ,lovely friendly helpful staff.Very lively at weekends if you like that . Good restaurant . WiFi only in reception area. Rooms a bit expensive for what they are .Car parking nearby is a bit difficult . Loved the breakfast and the balcony overlooking the beach. Closeness to beach. Views from rooms. Good breakfasts. Nightclub, Friday, Saturday,Sunday to 4am!!!! Very noisy. Residents continued to party in their rooms and corridors!!! Rooms would be 3 star. Great Room, fantastic views and location. Did not stay long enough. We had a superior room with a balcony. Very tastefully and comfortably furnished and a lovely bathroom. It would have been nice to have loungers on the very big sea facing balcony. We did have the most expensive room available and o not know about the other rooms. Fish in the restaurant was fresh and excellent. Friendly attentive staff. A little inconvenient to have to park the car about 5 minutes walk away and difficult to park when unloading the car on arrival. But staff were very helpful. View out of bedroom - onto pipes and a wall/. Important when booking to ask for room with sea view!! 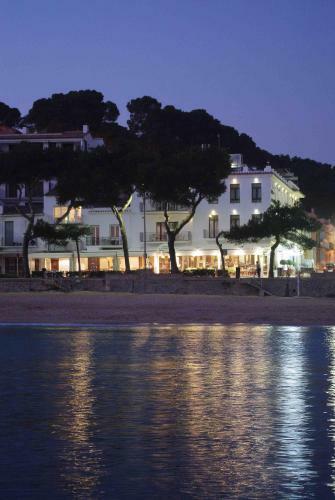 We had a nostalgic trip to Llafranc, returning after 40 years, and found Hotel Llafranc to be a perfect base. The rooms were extremely comfortable, and even though the hotel was very busy, we found the staff very helpful and friendly. When we booked, we were unsure as to what interior rooms were, so asked if we could upgrade. However none were available. As it happened, we were fine in the interior rooms, but would have loved a room with a balcony and view. We will remember this next time we book! Where to start--Hotel Llafranch has so much history--there are pictures of American and European celebs on the walls. The atmosphere, the ownership, the location (right across from the beach)--everything was wonderful. The breakfast was delicious and plentiful, the walks nearby were super--just loved my time there. The food was not perhaps super gourmet but it was delicious, especially if you asked the waiters lots of questions. El desayuno muy bueno, mucha variedad, calidad y puedes coger todo lo que quieras. El personal muy atento. La ubicación espectacular, primera linea de playa. Nuestra habitación pequeña (interior) y el colchón habría que cambiarlo, esta blando por el medio. Almost everything from he staff to the food , the fantastic location, the super rooms - nothing was too much trouble . Situacio i confort. Hotel recomanable. Good restaurant. Great breakfast included in the rate. 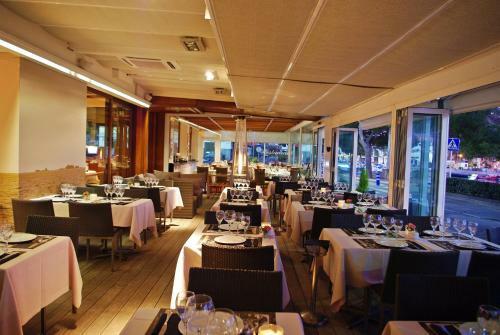 Prices at the restaurant are higher than the average for Llafranc. 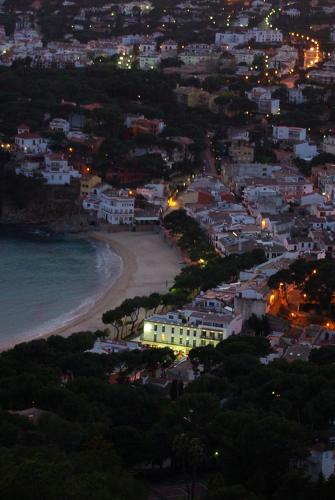 The hotel is located on a gorgeous section of the Costa Brava. You just have to walk across the street and you are on the beach. The restaurant has very good and fresh seafood. The owner couldn't have been nicer. He even gave us some wine to take home! The staff was very helpful with travel tips too. We came in March and the place did not have much open except our hotel. Evidently it is much busier later in the year but in March it is really quiet. Great for sleeping but not much to do. Not a negative exactly! Excellent situation beside the beach, our room had lovely views and a terrace overlooking the pretty little bay. Very comfortable and clean with excellent service everywhere. A lovely corner in the bar area with blazing logs and tables for light meals and breakfasts (at this time of year!). Superb buffet breakfasts and good Catalan menu. I recommend the Bloody Mary made by Pedro !